In today’s Scene it? I am looking at a very contested story-line within The Return of the Jedi. Although I will be discussing the whole story arc, I will be focusing on the scene that brings it to an end. I am talking about ‘slave Leia’ and especially “the bikini”, which is one of the things that has been incredibly divisive within the Star Wars fandom. I am currently on a rewatch of the 200 8 The Clone Wars series and realized that S1E08, ‘Bombad Jedi’ is an absolutely fascinating episode! Not only funny, it gives room to some major development for two of Star Wars‘ most interesting characters: Padmé Amidala and Jar Jar Binks. ‘Bombad Jedi’ works on a lot of different levels, reintroducing the political element of the Clone Wars and showing how war leads to suffering and betrayal. The episode, directed by Jesse Yeh, starts with the fortune cookie-esque ‘Heroes are made by the times‘, but rather than focus on our accepted heroes, Anakin Skywalker or Obi-Wan Kenobi, the episode goes out of its way to show that heroism exists on different levels and can be found in everyone. 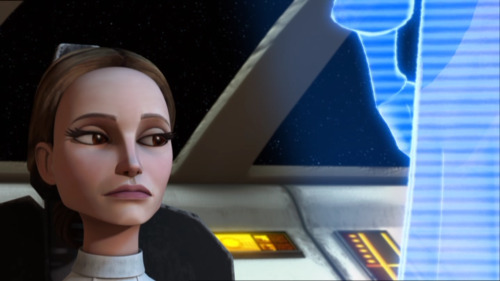 From the very start of the episode it is clear that Padmé is in control of this mission. Her unwavering loyalty to her friends has brought her into dangerous territory and yet she goes there believing in the strength of diplomacy and peace, in itself the start of a very heroic quest. In choosing Jar Jar as her companion, she also reveals her recognition of similar principles in Jar Jar. Chancellor Palpatine functions as a good point of contrast to her behaviour when he mocks Jar Jar’s “qualifications”. He not only disregards JarJar but also looks at him with contempt, unable to see the potential Jar Jar holds. Palpatine respects martial strength and Jar Jar’s own brand of strength is not something he recognizes, initially. In some ways this is similar to how he considered Padmé naive in The Phantom Menace only to have to admit by the end of the film that she is a lot stronger than he thought.